Most merchants on central Irving Street in the Sunset may have come around to the idea of turning 12 parking spaces into sidewalk extensions with greenery and stylized seating fixtures. At an open house community meeting last week, the opposition to the proposal seen at the previous meeting in August seemed to have largely dissipated, based on reports from some city staffers and merchant association members. Any remaining concern apparently comes from owners of businesses that front the small chunk of parking spaces that would be replaced with the bulb-outs, though they might actually stand to gain the most as their part of the street becomes a more attractive place to be. The plan for Irving between 19th and 27th Avenues presented at the open house by the SFMTA and Department of Public Works was essentially unchanged from the proposal shown at the previous meeting. That seems to indicate that complaints about losing a small slice of the 400-some parking spaces on or adjacent to Irving didn’t carry much sway. As we’ve reported, a small, unscientific poll of 30 respondents on Irving, gathered by DPW from door-to-door visits and an earlier public meeting, found that most people didn’t drive to get there — a result similar to those of more comprehensive surveys done in several other SF neighborhoods. 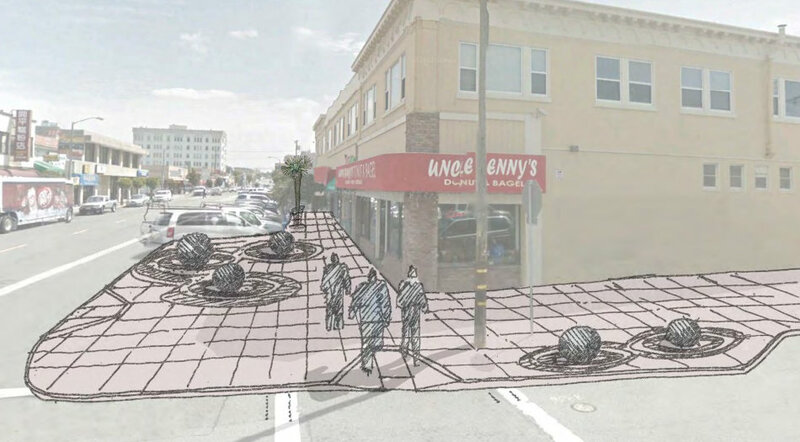 In addition to the sidewalk extensions, the plan will include more visible, patterned crosswalk markings, along with new trees and a re-pave of the street’s notoriously dirty sidewalks. As a neighborhood resident, it sure is refreshing to find that not all merchant groups are dominated by a hidebound obsession with car storage. But there was parking there, and always should be! We need all the parking, everywhere, all of the time. Yeah. The tourists will be really excited about hanging out in the fog sipping coffee on the sidewalk on Irving Street. Great views of shops in the fog as a backdrop for their group photos. Hopefully they will not get hit by a bus or bike swooping out of the fog as they cross the street. Aaron, any insights on what outreach/information/conversations changed the merchants’ minds?